Aquarians are the individuals of the zodiac, choosing to think and sometimes even behave just so differently from everyone else. Uranus, the dazzling and progressive planet, rules you and endows you with power electricity and a desire to be completely different to everyone around you. Many reformers and revolutionaries were born under this sign. Aquarius is the fixed air sign of the zodiac. Air represents the mind and the ability to think. Aquarian ideas may be unusual, or even original, but once formed they tend to remain fixed. Fixed air, in brief, is a metaphor for fixed opinions. You live wholly and solely on your own terms and your life and destiny is carved out by you and for you. Preferring to tread the beaten path is not on your agenda at all and you leave that to less adventurous individuals. There can be someone tucked away inside you who is extremely uncertain of his or her true identity. 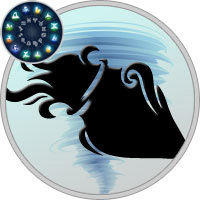 The Aquarius ego is said to be the most precarious in the zodiac, probably because Aquarius is the sign of non-conformity. Intellectual genius, practical eccentricity and mental oddity are all linked with Aquarius. You are determined and forceful in how you deal with others but at first can come across as somewhat aloof or even snobbish. You like to assess people and the situation first before laying down your cards and in some ways this is a technique for gaining the upper hand in your relationships. In your childhood you may have found yourself under the stern control of someone over whom you had no say. This leaves you quite sensitive if other try to take control and as you grow older you’ll be mindful of this fact. You have quite a different philosophy on life than most others and you’ll realize this quite early on in your life. You will tend to keep your dreams and ambitions tucked away in a secret place until you feel it is time to bring them out into the light for fear of being ridiculed. Even as you age you’ll be quite comfortable in the company of young people and you may be drawn to community and social issues involving youth workers. You want to make a difference in this world as you have quite a social conscience and may even work with groups or organizations that have a hand in uplifting the less fortunate in society. Your communication is very sharp and you relate extremely well to anyone with whom you come into contact. You have good organizational skills and you like to work with others, to express your ideas and come up with unique solutions to both personal and professional problems. Aquarius being an air sign is notorious for thinking. You like to get to the bottom of things and this is due to your curious and mentally precise insights. Creating through ideas is second nature to you and you believe that we grow with the expression of thoughts. You are not afraid of challenges and when arguing a point are most impressive due to your background knowledge. Unconventional again Aquarius in the way you study, live or present your ideas, but others will have to give you the due credit for your originality. Communication is your forte and you relate extremely well to anyone with whom you come into contact with. Throughout your life you will continue to evolve and grow as a human being. Your far-reaching attitude sometimes overwhelms your friends and family members and people see you as rather flamboyant, and even harmlessly mad. Uranus is also abrupt and thrilling by nature so your life will never be dull. Unexpected and exciting events will occur at every step of your pathway throughout life. If someone were to describe your day to day existence they would probably say that it was full of thrills and spills. Conventional is a word you really don’t want in your vocabulary Aquarius and boredom is not a feeling you want in any shape or form. Your approach to love and relationships is pretty quirky, as long as you are mentally stimulated. Once tediousness appears on the horizon, you are running to book a ticket out of there, wherever you may be. Birthdays are fun, and they can also be informative. Astrologically, each day supplies a collection of influences that contribute to creating a personality which is uniquely yours and yours alone. We hope that these Aquarius Birthday Horoscopes will help you understand yourself better. Look up your birth date to read about your astrological personality.